Pérez Art Museum Miami (PAMM) is pleased to present American Echo Chamber, a solo exhibition specially commissioned by the museum with José Carlos Martinat, one of the most internationally exhibited Peruvian artists of his generation. The exhibition investigates how ideologies are amplified and reinforced in the current social and political landscape. Located in PAMM’s unique double-height gallery, American Echo Chamber is comprised of 15 kinetic light sculptures, and additional LED screens, that explore the current state of our political and cultural landscape. 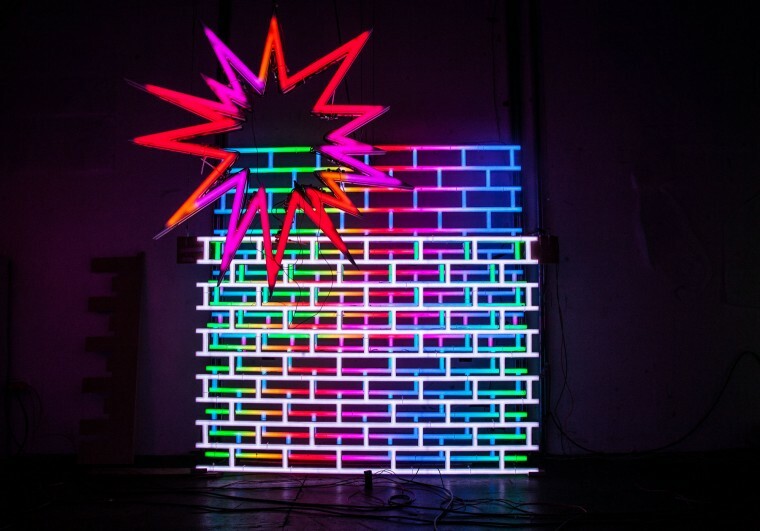 By portraying symbols of popular culture that relate to our current state of affairs, the artist uses the language of light and the pop of neon to highlight how serious issues have been reduced to entertainment. Inspired by the popular tradition of pyrotechnic parks in Peru, the artist adopts this medium of social amusement to tell a story about the breakdown of public discourse in both his original and adopted culture. These symbols range from historical images such as the political cartoon “Join, or Die” attributed to founding father Benjamin Franklin, to popular internet memes. Martinat is continually re-contextualizing symbols of violence, manipulation, racism, and migration as signs we “consume” everyday as citizens. By creating a space that amplifies the consumption of these symbols and information, Martinat compares the contemporary political scene to an echo chamber, emphasizing a dynamic in which people seek media outlets that reinforce their beliefs as an unconscious exercise of validation and prejudice. Martinat’s practice highlights society’s complex dynamics and intersections of technology, politics, and virtual social spaces. This year-long installation reflects PAMM’s engagement with the contemporary moment via the commissioning of new works, and further shows the museum’s ongoing commitment to presenting art from historically underrepresented communities, including the African diaspora, the Caribbean, Latin America, and US Latinx.